Who could resist smiling if they received this card??? It is so bright and cheerful! This was another card we made at Saturday’s Diva Day with Deb Valder, she wasn’t sure who to give credit to for this card, as she found it on Pinterest…. but I clicked away and discovered that this card was made by a demonstrator named Vicky Hayes. Since we like to give credit to those who create, or inspire us, thanks to Deb for finding this card and to Vicky for creating it! Can you tell what that oval frame is made out of??? It is our Gingham Garden Washi Tape item 129314 only $4.95 for three different rolls of this stuff. I am seriously addicted to washi tape, I am finding 100 and one uses for it- more on Washi tape in another post, another day. So you might be wondering how the washi tape turned into the oval frame? Deb put four rows of washi tape down on a piece of whisper white card stock, and then we nested the two smallest Ovals Collection framelits together, and ran it through the Big Shot! 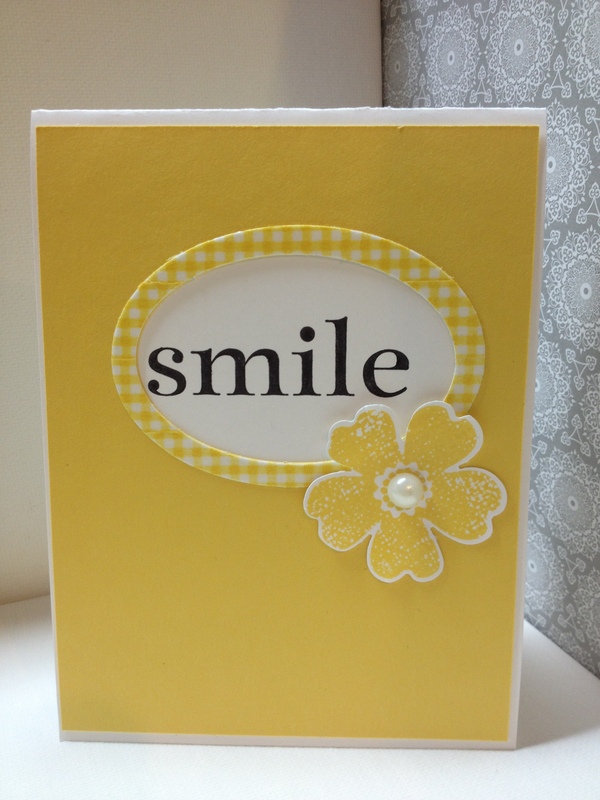 The word “Smile” comes from the stamp set “Happy Day”page 112 in the new catalog. Item #130297 clear mount is $16.95 or wood mount is item # 130294 for $21.95. The flower is from the new gorgeous stamp set called “Flower Shop” on page 94. In clear mount it is item# 130942 for $17.95 or wood mount is #130939 for $23.95 and there is a matching punch that popped this flower out- called the pansy punch (page 183) item number 130698 for $15.95 but WAIT- Stampin’ Up is offering this as a BUNDLE for 15% off the retail price- so use Item # 132726 to get both clear mount stamp and punch for $28.75 or item #132727 and get wood mount stamp set and punch for $33.95… wow, what a deal! Who can pass that up? Who would you like to make this card for?? Leave me a comment, I love to see what you think! Have a great day, and happy stamping! What a super-sunny card! It would be perfect as an any day pick-me-up at school… Something I’m always looking go as our Sunshine Club coordinator (and card maker!). Thanks to all for a fun yet simple design!